Natural light is an interior’s best friend and it is one element that cannot be controlled by a switch. However when life doesn’t give you sunshine, then LED has the answer. 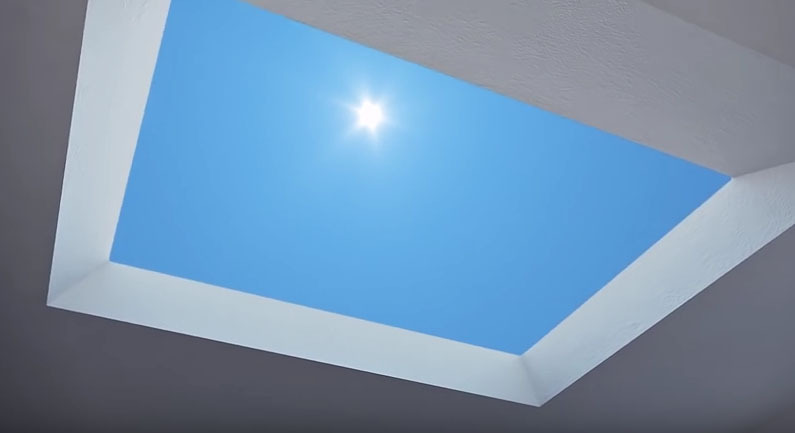 Italian company CoeLux has developed a skylight that has the ability to replicate the sun and sky so well that it is indistinguishable from the real thing. It can trick both the human brain and cameras. This brings the artificial lighting game to a whole new level and could mean a new way of thinking about ‘sunless’ spaces. Having grey skies for the last few months highlights the impact a sunny day can have. Sunlight changes the whole atmosphere of a city, let alone room. Interestingly, the blue sky feature of the skylight is as important as the light source itself. According to the inventor of the new tech, Professor Paolo Di Trapani, they took a lesson from the sky by simulating the process that makes the heavens blue. The technology emulates the behaviour of light scattering as it passes through particles in the Earth’s atmosphere, also known as Rayleigh Scattering, and condenses it into a mere few millimetres. The subtle gradations in colour are achieved by filtering the LED light through a layer of clear polymer coated with titanium dioxide nanoparticles. The LED light source is calibrated to have the same wavelengths as the sun. The system also offers a range of angles to mimic the sun at different latitudes. The configurations can produce the sunlight of the tropics, to the even glow of the Mediterranean and the warmer patterns of the Arctic light environments. The various locations are simulated by manipulating the size and placement of the LED “hot spot”. It sits roughly one meter above the filter, giving the perception of infinite depth. LED is notoriously superior to its illumination counterparts when it come to low energy consumption and large lifespan. To give some comparison; the skylight consumes 340W of electrical power and in contrast seven LV down-lights would have an equivalent power footprint. As LED technology is constantly improving, so is the range of longevity. Sunlight has a major impact on our health. The NHS estimates that around two million people in the UK are affected by seasonal affective disorder (SAD). Many people refer to this condition as “winter depression” due to their lack of exposure to sunlight. Dr. Ritsaert Lieverse, a psychiatrist from the VU University Medical Center in Amsterdam, spoke to The New York Times about her work with light therapy. She believes that the general population could benefit from the technology. The effectiveness of the CoeLux light for issues like this is still unclear, especially as it does not emit ultraviolet rays. However, regardless of health benefits, the illusion of natural light is a strong one and could make us rethink how we design subterranean spaces. This could enable us to use basement spaces in new ways and perhaps even repurpose the disused underground networks of London. Professor Paolo Di Trapani suggests that this new lighting concept could see the beginning of the ‘groundscaper’, the reversed skyscraper, a life underground, with the sense of basking in the sun.